NEW YORK CITY — Former Laker, Magic Johnson, will appear at the NBA All-Star Weekend Pop-Up Store on Saturday Feb. 14, 2015 to sign autographs and memorabilia. The signing will be from 11:45 am to 12:45 pm at the NBA All-Star Weekend Pop-Up Store located at 47th & Lexington Avenue in NYC. For more information about the signing, click here. 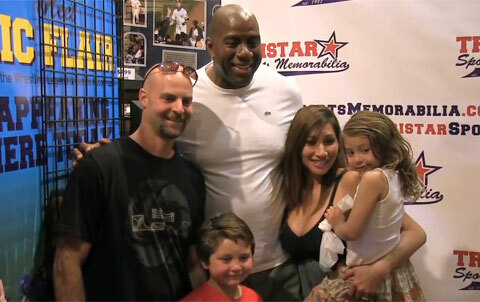 Magic Johnson meets his fans at Tristar Sports Memorabilia on April 24, 2014 in Las Vegas. Magic Johnson was honored as one of the 50 Greatest Players in NBA History in 1996, and enshrined in the Basketball Hall of Fame in 2002. He was also rated the greatest NBA point guard of all time by ESPN in 2007. If you would like to book NBA players like Magic Johnson for a speaking engagement, autograph signing, meet and greet, guest appearance, product endorsement, celebrity golf tournament, charity fundraiser, VIP meet & greet or special event, contact Magic Johnson agent for speaker fees or call 800.966.1380.